The kitchen in the first image is full of tools, with the chef cooking on a grill and in pots over the fire. The heat from the fire also heated the oven on top. What appears to be a boiler is to the left of the stove/oven, by the waiter, which would have held hot water, coffee or soup. Sala recounted the various ways passengers were fed on the different railroad lines. Orders were telegraphed to Wilmington where meals of fried oysters and beefsteak were put in picnic baskets, then placed on improvised tables of mahogany planks in the cars. (table shown in third image) On another trip, west of Iowa, the passengers had to leave the railway cars to eat in restaurants. "So we took the North-Western from Chicago to Council Bluffs [Iowa]…in one of the newest and the handsomest of the Pullman Sleeping and Hotel Cars, the "International." [They are] similar to those of the Pullman Restaurant Cars which, when I left England, were beginning to run on the Great Northern Railway between King's-cross and Leeds. The American bill of fare, however, comprised sundry dainties which might be looked for in vain in railway England. We were offered prairie-chicken, blue-winged teal, and golden plover, oysters cooked in half-a-dozen styles, stewed tomatoes, sweet potatoes, and a pleasing variety of omelettes. A lady and gentleman in the car (on their honeymoon trip, I suspect) partook of an omelette au rhum, to which fire was duly set. It was good to watch the cheerful blaze." 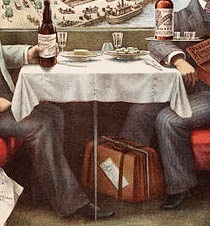 "Somewhere in Pennsylvania … the conductor of the Parlor Pullman apprised me that refreshments could be served on board the car on our arrival at Wilmington, in the State of Delaware. Straightway the careful conductor, unlocking a cupboard, produced a stack of well-polished mahogany planks. One of these he brought into an horizontal position, and by means of a symmetrical arrangement of pegs and holes, dexterously "hitched " one side of the plank to the wall of the car. From the other side a flap-leg was letdown; and at once a table was improvised. Once more the train started; and anon a slim youth made his appearance in the car, bearing a towering pile of deep quadrangular baskets of the "picnic " kind. One of them he deposited in front of us. The well-packed picnic basket being opened, the board straightway "groaned under the delicacies of the season." The fried oysters were a great success. They were a little shorter than French sabots, and not quite so wide as the knife-board of an omnibus; but they were very toothsome. The steak was well broiled, tender, and juicy. Moreover, there were fried potatoes, crisp and hot; good white bread, fair butter,* tolerable coffee, and excellent lager beer, sparkling, exhilarating, and non-intoxicating. * Not from one end of the United States to the other, have I ever tasted any butter equal to our Cambridge "best fresh," or to the butter of first class Paris restaurants. The very best American butter tastes more or less of salt; and butter should be sweet. American housekeepers will probably vehemently dispute my contention. When our repast was concluded, the picnic baskets were repacked, and the slim youth, bearing a pile of them much taller than himself, disappeared from view. It was the conductor with whom we settled. The entire charge for our collation was one dollar and fifty cents — say six shillings — including the use of the table, which could be afterwards utilised for the purpose of indulging in the mirthful ecarte or the innocent picquet." Sala, George Augustus. America Revisited: From the Bay of New York to the Gulf of Mexico ... 2 vols. London: Vizetelly & Co., 42, Catherine Street, Strand, 1882. Life certainly has gone downhill.